Random.org chose "ohkeeka" as the winner of this wonderful giveaway from Tate's Bake Shop. Thanks to everyone who entered and please leave a comment on my "Karen's 2 Days of Christmas Extravanganza" post to win my next giveaway for a $65.00 CSN online gift code. What the heck are we Americans thinking? This Christmas shopping thing has gotten totally out of control. Not only do we have people in our neighborhood decorating for Christmas a couple of days after Halloween, but Black Friday has now bled into Thanksgiving Day. In case you didn’t know it, Sears was open on Thanksgiving from 7 – 12 so you could pick up a new fridge on the way to grandma’s house for lunch. Kohl’s opened their doors at 3 am on Friday. 3 AM?! What could Kohl’s have in stock that gets people to interrupt their tryptophan coma and crawl out of their warm beds in the middle of the night only to stand in line for hours? Industrial diamond rings for $39.00 or quesadilla makers for $9.99? Sorry, I’ll pass and pay the extra 10% on Cyber Monday. I admit that several years ago I got up and was at Target at 4:45 am. With my tired turkey baking muscles burning and blood shot eyes feeling like someone had thrown a handful of sand in them; I took my place in line to buy two $29.00 Kawasaki (I should have known better) 7” compact video players for the kids. Long story short, I managed to beat some old woman with a walker and two pregnant ladies in a foot race to the electronics department (losers!) and got two of the last few players. Karma caught up with me a week after Christmas when my daughter’s player stopped working. I promptly took it back to Target only to find out that it was part of their limited seasonal stock that they only carry for Black Friday. I landed up paying full price on a brand name replacement. Lesson learned, no more off brand Black Friday specials for me. You can keep your Windex power tools and Keebler televisions; the man is no longer tempting me with his pseudo bargains. 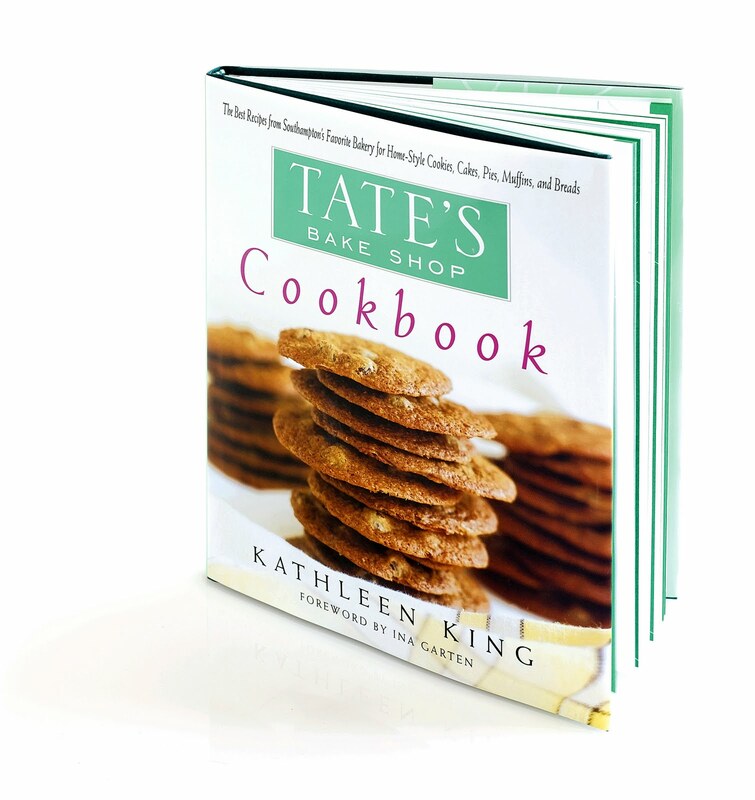 I have a beautiful box of cookies and one of Tate Bake Shop's glorious cookbooks to give away to one of my readers. If you’d like a chance to win, all you have to do is be one of my followers and leave a comment to be entered. If you would like an extra entry, “Like” Tate’s Bakeshop on their Facebook page and state so in your comment. 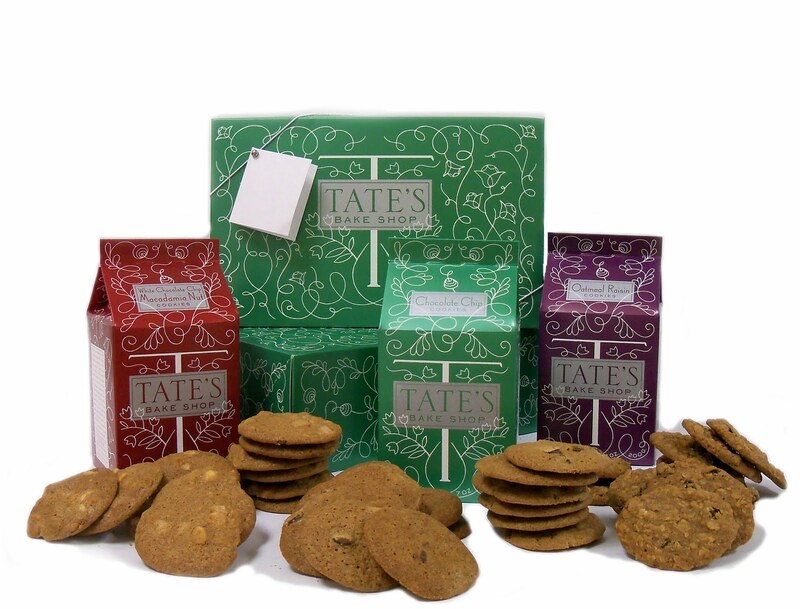 In the meantime if you’d like to order some of these special cookies, Tate’s is offering my readers a 15% discount on their online orders at tatesbakeshop.com from now until December 31st. Just enter the coupon code “cookie” at checkout. Good luck and happy shopping! Of course, if you’d rather stand in line for that industrial diamond, don’t let me discourage you. Oh by the way, I will let Random.org choose my winner on December 6th so hurry and get those entries in! I decided to bake something from Tate's beautiful cookbook for you here today. It was a hard decision but I finally decided on the blueberry buckle. It came out beautifully as written even though I prepared it above 6,000 feet so high altitude bakers, this one's for you. It is soft and fluffy and not overly sweet. The crunchy cinnamon crumb topping is just perfect. This will definitely be on my Christmas brunch table. Preheat oven to 375 degrees. Grease a 9-inch square pan. In a large bowl, cream the butter and sugar until they are well combined. Add the egg, milk, baking powder, and salt. Mix the ingredients well. Stir in the flour 1 cup at a time, scraping down the sides of the bowl between additions. Fold in the blueberries. Spoon the batter into the prepared pan and set it aside. To make the topping: Combine all the ingredients in a medium-sized bowl. Mix them with a pastry blender or your hands until they are combined and crumble. Sprinkle it evenly on top of the cake batter. Bake the cake for 45 to 50 minutes or until a cake tester or toothpick inserted in the center comes out clean. Yield: 1 – 9” square buckle. I will never forget my first run in with a hot chile pepper. I was seven and it was an innocent and fun looking little garnish on the side of my plate of cheese enchiladas. Thinking it would surely just taste like lime green, I took a big bite only to have it take a big bite right back out of me. Smoke shot from my ears accompanied by what I can only describe as a blasting train whistle sound. I don’t remember what happened next because everything went black, but as you can tell I survived, with no less than a true respect for anything that looked like a pepper no matter what the color. It took me several years but my memory of that first chile pepper experience faded a bit and I decided to give them another try. Slowly I began to really like them. I think part of their appeal is that they come with a built-in sense of adventure. You never know exactly how hot or mild most of them will be until you take a bite. They are kind of like dating a “bad boy," you know that you are probably going to get hurt, but you just can’t resist going back for more. One thing is for sure; the addition of chile peppers can make even the most bland of recipes really interesting. A little over a week ago I took Marx Foods up on their "A Chile and a Spoon" blogger challenge and agreed to make a dish using at least one of the six types of chile peppers that they furnished me with. The sample box that arrived was stuffed with an intriguing selection of dried peppers. It included the round and plump looking Cascabel and the large Guajillo chilies, both with a mild flavor. On the medium side of the scale were the long and thin Puya chilies and one of my absolute favorites, smoked Serranos. The two hot chilies in the box were dried Thai chilies (that were actually labeled as “extremely hot”) and the less lethal little round red Tepin chilies that while still hot, were labeled as “powerful but brief heat.” I liked that idea, so the Tepins were the ones I decided to work with. The only other stipulation of this challenge was that the prepared dish be one that was to be eaten with a spoon. Hmmm, as I see it that pretty much limits it to a soup or a squidgy dessert. Well, after going back and forth between the two, dessert finally won out. After baking and tweaking for the best part of a day, the end result is one of the best desserts I have ever eaten. It is a sweet and spicy combination of buttery goodness that provides a pleasantly powerful spark of heat at the end. This little pepper is perfectly complimented by the cinnamon and cherry flavors and produces no less than an exciting dish for lack of a better description. Even though I used cherries in my recipe, I can only imagine how good it would be with apples, peaches, berries or any other fruit you might have available. Clockwise from top left: Cascabel, Guajillo, Smoked Serrano, Puya, Tepin and Thai. Place softened ice cream and almond extract in a large bowl, stir well to combine. Return to freezer to refreeze for later use. In a large bowl combine Tepin peppers, oats, brown sugar, granulated sugar, flour, and cinnamon. Cut in butter with a fork. Mix in almonds, set aside in refrigerator until ready to use. In a large bowl combine sugar, flour, baking powder, milk, vanilla and almond extract stir well and set aside. Pour melted butter in the bottom of a 9 x 9” glass baking dish. Pour cobbler batter over the butter in the baking dish, do not stir; spoon cherries and a couple of tablespoons of the juice evenly over the batter. Place in preheated oven and bake for 15 minutes. Remove from oven and sprinkle crumb topping evenly over the top (some of the topping may sink during baking, but it will still be delicious). Return to the oven and bake for an additional 25 to 30 minutes or until it is golden brown. Remove from the oven and cool for 10 minutes before serving with ice cream. I started the Master Cleanser this morning. It is now 8:30 a.m. and I am starving. Never mind that on a normal day I frequently don’t eat anything until 11 or 12, but this morning even that crappy Halloween candy that no one wants in the bottom of the drawer looks pretty good. Boy, it’s going to be a long ten days. I have to admit (because I know that you won’t tell anyone) that I’ve already cheated by drinking a cup of coffee and taking three ibuprofen. Starving is bad enough. Starving with a headache is more than I can bear. For those of you that aren’t familiar with this regimen it is no more than liquid torture. It is basically lemonade made from water, lemon juice, maple syrup and cayenne pepper. Well wait a minute; I might be going a little too far by saying that, because this “diet” is not without its treats. Every morning you are allowed a cup of dieter’s laxative tea (with mint for your dining enjoyment) or a good old saltwater flush with a warning not to leave the house for at least 1-1/2 hours after you drink it. Sounds fun huh? By now you must be asking yourself why in the hell I’m doing this? Well, I really have no other recourse. I have indulged myself right to Pudgyville. When your favorite jeans are too tight you can write it off to shrinkage, but when your wedding ring and shoes are too tight, something must be done and done fast, hence the Master Cleanser. In preparation for this torture, I’ve been storing up some photos to keep us going here at Eat Drink Wash Up for the next week or so. Please include me in your prayers. I’ll need ‘em. A few years ago at one of my son’s basketball games, one of the dads who is a real foodie told me about a Korean market here in Denver that he really liked. I filed this in my “someday I have to do that” folder and kept pushing it to the back. Well, armed with a what the hell attitude one pretty afternoon, I got on the internet and mapped it and headed out. Oh, my gosh! What I found was one of the most fascinating and delightful markets I have ever been to anywhere. Once you get past the wafting faint smell of rotting fish when you first walk in, keep winding through the mini flea market and the Asian video rental kiosk and you will find your reward, a produce section like no other. I have never seen so many intriguing and foreign looking fruits and vegetables in my life and I’ve been around the food block a time or two my friends. Well, I’ll just let you see for yourself by the following photos I managed to snap while I was there. The not so grand entrance. Beware, every trolley has a wonky wheel or two. Indian Bitter Melon. I have never cooked with these but I plan to! Asian candy that was all $4.99 a bag. The most intimidating aisle of soy sauce that I have ever seen. Well, this is usually where I add my recipe and I did make one with some of the birds eye chilies. Between them and the green curry powder that I mixed them with, my Thai Green Curry Chicken was so hot that I had to call the fire department to put out my husband's mouth. I promise I'll give it another try when I can eat again. Why is it that almost every day we are delivered a new food warning through the media only to have it retracted a couple of years later? I don’t know if it is because the researchers doing the study are so excited to get their news out that they release it before it’s actually finished, or it is such a slow news day that someone just makes it up. Case in point, this morning on the news they announced that the Omega 3 oils in salmon are no longer believed to ward off Alzheimer’s disease. Well, crap! My poor mother in law has been buying salmon and vitamin supplements for years in hopes that she will retain all her marbles to the grave. All of her poached fish eating, vitamin taking and passing on grilled hamburgers and dessert might have done some good, but tomorrow we might just find out that not eating them is killing us too. Poor dear, I guess she should have saved her money and bought herself a new car. Personally, I think maybe her wine drinking has preserved her heath more than anything else. I don’t know about you, but that gives me some hope. Speaking of food and health, I also got a chance to see an author on TV this morning that has written a book on the secrets of people who never get sick. Well, I’m betting that you will never guess what keeps them well. Ok, I won’t keep you guessing for too long. They stay healthy by eating dirt and raw garlic. Now, why in the name of all that is holy, do so many “super foods” have to taste so bad? I mean wouldn’t this be a perfect world if butter and Snickers bars were chock full of fat fighting, cancer curing, Alzheimer hating enzymes that would run through your body while reclining on the sofa watching The Real Housewives of New York City? This dream is right up there with my wish for world peace and a vacation home on Maui. Maybe those food researchers ought to think about doing something really valuable for mankind and invent something like healthy whipped cream instead of dishing out all of that doom and gloom…just saying. Now I hear that the great minds of the world are trying to force McDonalds to take the toys out of Happy Meals. I guess they just now caught on to the fact that kids are ordering food just to get a toy. So what, I gladly admit that I bribed my children with a Happy Meal a time or two just to get them to eat something. Besides, I kind of like those toys too! Oh well, I’m sure they probably cause cancer anyway. I must admit that these studies do get me thinking about how I eat. After pondering the subject, I realized that maybe I could lighten things up by cutting the fat and calories a bit. I racked my brain and decided to make a favorite soup of mine that, while it may not be a nutritious as dirt and raw garlic soup, it is on the lighter side. I am also including a healthy snack for kale chips that I discovered on my blogger friend Conor’s blog at http://www.holdthebeef.com/. This is a surprisingly quick and easy little snack of crispy leafy greens that are as light as air and you can flavor in a variety of ways. I had some cheese sprinkle leftover from my Savory Spice giveaway a few weeks ago and tossed it with some of these cooled chips and the results were addictive to put it mildly. I also had some spice blend that I picked up in Texas that is no more than seasoned salt with MSG but boy is it tasty. I mixed this with just a pinch of cayenne pepper and it was delicious as well. Basically these chips are a blank canvas that you can just have fun with. Not only is this a simple and delicious dish, it is super economical. Using just one chicken breast and one avocado to feed four hungry people makes it just about the perfect dish. If you would like to try a vegetarian version, substitute the chicken bouillon with vegetable bouillon and try hominy, sweet corn and/or black beans instead of the shredded chicken. Place chicken breast, 4 cups of the water and bouillon granules in a large saucepan over medium high heat; bring to a boil, reduce heat to low, cover and simmer for approximately 15-20 minutes. Remove chicken breast from the broth and transfer to a cutting board to cool before slicing into 4 equal size portions across. Tear each section into shreds with your fingers; set aside. Strain chicken stock and reserve. Spray tortillas lightly on both sides with non-stick cooking spray. Stack tortillas one on top of the other and cut in half, then in 1/2"strips in the opposite direction. Place in a single layer on a cookie sheet and bake in the preheated oven for approximately 8 minutes or until the tortilla strips are crispy and golden brown; remove from the oven and set aside until ready to use. Pour oil in a large saucepan and heat over medium high heat. When the oil is glossy, sprinkle flour over the top and whisk constantly to form a roux; lower heat to low. Pour chicken stock gradually into the roux, whisking constantly. Add the chili powder, cumin, coriander, granulated garlic, and onion powder; stir well to blend spices in completely. Add the bay leaf and shredded chicken; increase the heat to medium and bring to a simmer. Cook at a simmer for 2 minutes stirring frequently. Reduce the heat to low, cover and cook for 5 minutes. To serve ladle equal amounts of the soup into four warm bowls. Garnish each serving with desired amounts of the tortilla strips, avocado, cilantro or chopped green onion and shredded cheese. Preheat oven to 325 degrees (160C). Wash and thoroughly dry desired amount of kale. Toss and spray kale with non-stick cooking spray before placing on a single layer on a cookie sheet. Watching carefully, bake for approximately 10 minutes. Remove from the oven and sprinkle with salt or other seasoning.